I should have posted this yesterday to mark Earth Day, but since we should be thinking about these issues every day – not just on an arbitrary Friday in April – here is a short video made by a German group, PowerShift, which offers a quick overview of some issues related to energy policy. The video focuses on the use of biomass (like trees) from developing countries to produce energy in the West, using the example of a German company which purchases rubber trees from a Liberia-based company, Buchanan Renewables (which is actually a cool company, worth checking out their work), to use in a power plant in Berlin which uses gas and biomass. The idea they present is that instead of perpetuating a cycle whereby rich countries use up resources of poorer countries to support their unbridled energy consumption, we should turn to smaller-scale, decentralized models of energy production. I am not an expert in energy policy by any means – but I instinctively agree with the notion that we need to rethink our models of energy production. We are hooked on oil, gas and coal, and have developed unsustainable energy consumption practices. I fully support the efforts of those who are committed to thinking about new and innovative means to produce energy. As individuals, I believe we have a responsibility to curb our own energy consumption as much as we can – it’s not so hard to turn off power bars connected to the wall, drive a little bit less, buy at least some of your food from local sources. Every bit makes a difference. Furthermore, we can also support the efforts of companies like the one presented in the video. Even simply talking about these alternatives, raising awareness among friends and family that a different way is possible, can go a long way toward shifting paradigms. Are these types of actions, performed by politicians and legislators, more effective at influencing the policy making process than non-profits, international organizations and scientists? Boy am I late in the game here…It’s not even *really* October 15th anymore, but hey. In any case, I’m really happy to contribute to Blog Action Day 09 (BAD09). If you haven’t heard of it, BAD09 is a great, simple initiative from our friends over at change.org. Basically, it’s “an annual event that unites the world’s bloggers in posting about the same issue on the same day. Our aim is to raise awareness and trigger a global discussion.” BAD organizers emphasize that the first and last purpose of BAD is to create a discussion – clearly, a blog post (or 10,000) can’t be the tipping point on an issue like climate change, which is not only broad and complex, but also divisive and polarizing. It’s an honor to be a part of it, and I hope that this post will, at the very least, be thought provoking. There is strong evidence that under most climate change scenarios, water resources in small islands are likely to be seriously compromised. Polynesian cultures on small islands in the Pacific have a long tradition for adapting to climate change and variability, as well as to changes in other factors, in order to maintain their culture and way of life. Current and future climate change constitutes, however, a qualitatively and quantitatively different set of challenges. While there is still some degree of uncertainty as to exactly what the impact of current climate patterns will be on island atolls, there is a broad consensus that (i) these effects are caused by increased CO2 in the atmosphere, a lot of it attributable to human activity and, (ii) that there is a strong chance that these islands will become unsuitable for people to live on. In fact, it is the very existence of island atolls that is at stake. The president of the Maldives is desperate for the world to know how seriously his government takes the threat of climate change and rising sea levels to the survival of his country. He wants his ministers to know as well. 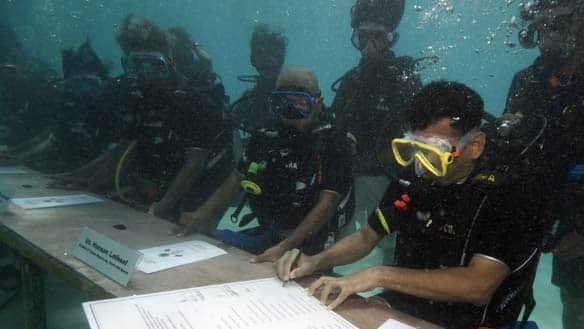 To this end, Mohamed Nasheed has organised an underwater cabinet meeting and told all his ministers to get in training for the sub-aqua session. Six metres beneath the surface, the ministers will ratify a treaty calling on other countries to cut greenhouse emissions. The Maldives highest point is 2.4 meters above sea level. In the Pacific, the Carteret Islands have become the poster child for the issue of climate related migration flows. The Carteret Islanders, a matrilineal community living on an island chain 50 miles off the coast of Papua New Guinea, have become the world’s first “climate refugees”. The government of Papua New Guinea has begun the evacuation, scheduled until 2020, of some 3,000 islanders. While predictions vary as to the precise number of people around the world who will be forcibly displaced by climate related events, a commonly accepted figure is that an estimated 200-250 million people will have to migrate by 2050 as a result of climate change. According to Oxfam, 75 million of these people are living in poor islands and low-lying areas of the Pacific. And, as the evacuation of the Carteret Islands is a clear demonstration of, there is an urgent need to create legal safeguards for “climate refugees”. Clarifying UNHCR’s position, Yoichiro Tsuchida, UNHCR Senior Advisor on Climate Change, explains that the case for environment refugees is too complicated and disparate to fit within the current refugee framework. Justifying international migration due to natural disasters is difficult, as is the task of attributing environmental phenomena directly to climate change. “While environmental factors can contribute to prompting cross-border movements, they are not grounds, in and of themselves, for the grant of refugee status under international refugee law,” she says. Tsuchida claims that “the broader international human rights regime” should serve as the basis for guiding the responsibility of states towards people who are in need of international protection but who do not qualify for refugee status. Elements of a response are being developed – Australia and New Zealand, whose small neighbors are sinking, are beginning to shape policy responses. New Zealand, for example, has a Pacific Access Category for migrants hailing from Pacific islands, a fast track, simplified immigration option. The Australian Labour Party published a policy paper in 2006, “Our Drowning Neighbours“, which outlines steps for Australia to take to assist Pacific islands. The paper includes recommendations regarding what sort of assistance Australia should provide Pacific islands to mitigate the effects of climate change, as well as its responsibility as a leading voice for the advocacy of strong action internationally and locally to address climate change. There is growing evidence suggesting that mobility, in conjunction with income diversification, is an important strategy to reduce vulnerability to environmental and non-environmental risks – including economic shocks and social marginalisation. In many cases, mobility not only increases resilience but also enables individuals and households to accumulate assets. As such, it will probably play an increasingly crucial role in adaptation to climate change. Policies that support and accommodate mobility and migration are important for both adaptation and the achievement of broader development goals. Addressing climate change is more than just figuring out how and when a carbon tax is appropriate, or whether coal is clean or not. It will force us to grapple with very difficult and fundamental questions about the preservation of culture and civilizations. Yesterday, I came across a TED talk by Ray Anderson, the CEO of a carpet company. Now you might think – as I did – that hearing Mr. Anderson’s take on the “business logic of sustainability” would probably not be the most enlightening and thought provoking experience (again: carpet company.) Well, that is a misguided impression, dear reader, and I invite you to check out his 15 min talk in the video below. Personally, I’m a huge fan of the Environmental Impact Equation (min 4:40), and particularly of his re-writing of it (min 11:18). Obviously, developing a “new civilization” is no easy feat, and you can’t draw a fancy road map for completing this task. Nonetheless, the notion that Anderson introduces in his speech, that we must decrease the importance of “Affluence”, and increase the importance of “Happiness” in our calculation of the impact of production really appeals to me (watch the video, really). Sure, it’s a pipe dream – and for working with (and not for) the private sector on a daily basis, I know that the notion of the triple bottom line is far from being a central tenet of modern business. The video [The Story of Stuff] is a cheerful but brutal assessment of how much Americans waste, and it has its detractors. But it has been embraced by teachers eager to supplement textbooks that lag behind scientific findings on climate change and pollution. And many children who watch it take it to heart: riding in the car one day with his parents in Tacoma, Wash., Rafael de la Torre Batker, 9, was worried about whether it would be bad for the planet if he got a new set of Legos. Of course, no one wants their kids (or other people’s kids, even worse) becoming staunch and unwavering advocates of the environment at home – I can already picture children across America going through their mothers’ cosmetics and hiding/throwing away (I mean, recycle) all of the products that don’t meet their high standards. Regardless – and seriously – I do believe that tackling the question of how to adapt our modes of production/consumption to current realities (more people, more pollution, less resources) will require some efforts on the educational front. Leaders of tomorrow (it’s apparently too late for today’s leaders) will need to view the world through the filter of sustainability – and that can only happen if we educate and shape our young generation to respond appropriately to the challenges of their time. The Story of Stuff is an amazing video, which I highly recommend you watch – similarly to the Anderson TED talk, it shows how modern means of production are outdated. I’m not surprised that it’s being used in classrooms across the US to teach students about the environment and climate change. Living in Vancouver, I sometimes feel like I live “in the future”: few people still use plastic water bottles, taxis are almost all hybrid, buses are electric, electricity comes mostly from hydropower… etc… There are so many signs that we are turning a corner in terms of how we approach consumption/waste – but not nearly enough, in my view. And I suppose it will take time. And that, to a large extent, it’s the millions of small, everyday paradigm shifts that really make a difference (recall Rafael de la Torre Batker who was worried about the effect of a new set of Legos on the planet). The Economist published a story about money growing on trees. Wait. What?